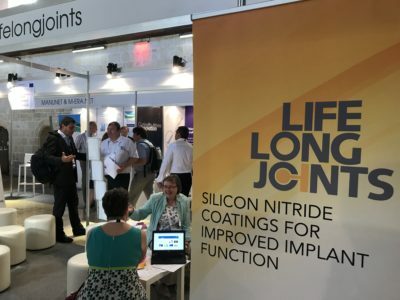 LLJ is exhibiting alongside a few other nanotechnology projects on a stand organised by the Nano Industries Association at this year’s EuroNanoForum held in Valetta, Malta 21-23 June. Around 1000 delegates have gathered to gain a snap shot of not only what projects are being supported by the Framework Programme but also measures being taken to support innovation. On the exhibition stand itself, the NIA organised two very interesting presentations relating to regulation development for nano-technologies embedded in products which generate some thoughtful discussion. Guillaume Flament, working for NIA based in Paris gave an overview of the current regulatory framework, followed by Anthony Bochon a lawyer specialising in nano-technology compliance with Squire Patton Boggs, who discussed the legal position that companies need to take account of. This generated quite a bit of discussion over how to ensure good management of risks while not discouraging innovation. LLJ is an example of a development that can shine positive benefits of nano-technologies, but as with all new medical device developments has now to take into account a more stringent compliance regime following the introduction of the new Medical Devices Regulation which takes effect from 2020.